Jean Baptiste David, 4th son and 6th child of Jean Pierre David and Marie Magdelaine Monmellian, was born on 22 July 1725 at Louisbourg and baptized the following day, 23 July 1725. His godparents were Jean Richard and Marie Cecile Boucher. Presiding at the baptism for the Abbot was Fre Jordore Caulet. Jean Baptiste's Act of Baptism record notes that his father, Jean David, was at that time a "blacksmith and resident of Louisbourg." Little is known regarding Jean Baptiste’s life at Louisbourg between 1725 and 1758. Only 5 primary source records have been uncovered which list his name. These include his baptism record above in 1725, the Louisbourg 1749-1750 Census and his burial record in 1758. His name is also listed as a witness at a baptism in 1756 and as godfather at a baptism in 1757. Jean Baptiste's name is also listed within 2 Fortress of Louisbourg secondary source abstract documents, a Family Reconstitution File and a Historical Memoranda of his father, Jean Pierre David. In addition, the Louisbourg 1726 and 1734 Census records indirectly indicate his presence in Louisbourg for those years. 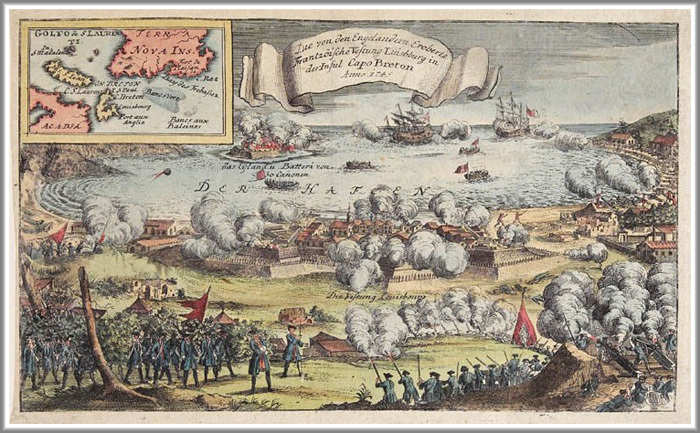 The timing of his death at the age of 32 on 18 March 1758 may have indicated that Jean Baptiste was a Fortress of Louisbourg soldier and died in the line of duty during one of the many war time skirmishes leading up to the 2nd siege of the Fortress of Louisbourg on 26 July 1758. 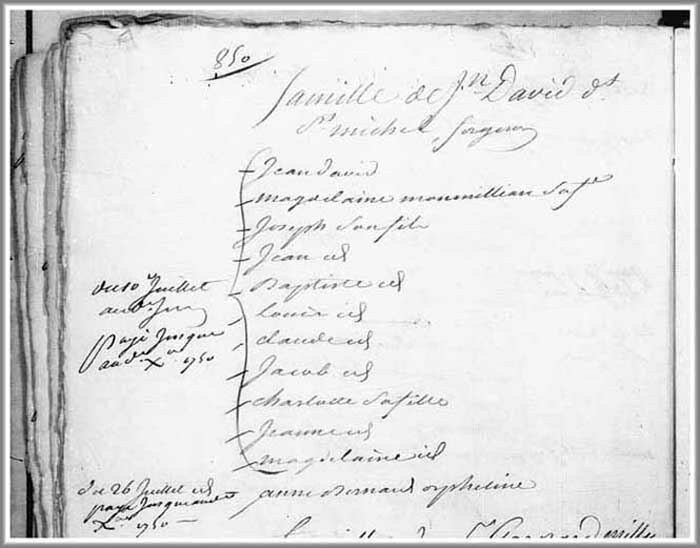 Jean Baptiste's presence in Louisbourg is indirectly recorded in the Louisbourg 1726 Census which lists his father, Jean David dit Saint Michel of Nantes, a blacksmith, a wife, Marie Magdelaine Monmellian, 4 sons under 15, Pierre, Michel, Jean Jacques and Jean Baptiste and 2 daughters, Magdeleine and Marie Josephe. The last 5 of Jean Baptiste's siblings to be born at Louisbourg were Claude Thomas born on 20 December 1735, Jacques Andre born on 30 November 1737, Jeanne Olive born on 10 July 1739, Marie Magdeleine born on 16 January 1741 and Jeanne Angelique born on 21 December 1743. On 18 March 1758 at the age of 30 years, a Baptiste David was buried in the Cemetery of the Parish of Louisbourg. Although Fortress of Louisbourg historians document in the Family Reconstitution File of Jean Pierre David, it is not confirmed that this Baptiste is Jean Pierre's 4th son, Jean Baptiste. At the time of this burial, Jean Baptiste would have been approximately 32 years 7 months of age. In addition, it has been documented in an earlier Louisbourg baptism record that another Jean Baptiste David La Vigne was an inhabitant of Louisbourg and a ship captain. The cause of Baptiste's death is unknown. However, it may have been related to his possible military profession and the 2nd siege of the Fortress of Louisbourg in 1758. Fre Patrice LaGree presided at the burial. On closer review of the original source document folio that this burial record appears within, the 2 prior burial records of a Jean Cousin La Vigne and a Julian Cousin are dated the same day as Baptiste's burial and have very similiar wording. Could it be that these 3 men died in a naval battle related to the 2nd siege of Louisbourg? Jean Baptiste's documented presence in Louisbourg is recorded in a Family Reconstitution File of his father, Jean Pierre David, which is archived at the Fortress of Louisbourg National Historic Site of Canada. This Family Reconstitution File was abstracted and compiled from original source documents archived at the Archives of Canadian and the Archives Nationale. Two primary source documents have been uncovered that document a Jean Baptiste as a witness to a baptism in Louisbourg in 1756 and as godfather at another baptisms there in 1757. The first of these baptism records not only indicates that this Jean Baptiste was literate but it also documents his profession as a ships capitan in the French navy at the Fortress of Louisbourg which may have been tied to the reasoning for his death in 1758. On 30 April 1756, a Jean Baptiste David La Vigne is recorded as the godfather of Jeanne Louise Dumoncel born, the daughter of Michel Dumoncel, merchant of this city and Genevieve Clermont. She was baptized the following day, 1 May 1756. The child's godmother was Demonsielle Genevieve Dumoncel, sister of the Jeanne Louise. Fre Pierre D'Alcantara Cabaret presided at this baptism. Witnesses attending the baptism were recorded as Dumoncel, Genevieve Dumel, Jean Baptiste, Marie Dumoncel, Le Comberre, Loppinot, Beauport and St. Aigne Bacquerisse. What is interesting about this baptism record, is that it documents a Jean Baptiste David La Vigne as a ship captain, possibly a military naval officer. In addition, this Jean Baptiste David's signature on this baptism record indicates that he was literate and is the only record of his signature yet uncovered. On 2 February 1757, a Jean Baptiste David is recorded as the godfather of Jean Baptiste Le Roy, born the son of (unnamed) Le Roy and Marie Anne Martin. He was baptized by the midwife or another witness to the birth at the home. The batptism record is dated 4 February 1757. The child's godmother was Anne Dou (unnamed). Fre Pierre D'Alcantara Cabaret presided at this baptism. Witnesses attending the baptism were recorded as Louis Joly, Josephs and Bailac. 15 Nov 2010 - The theory related to the 18 March 1758 burial record of a Baptiste David has been reworded. 15 Nov 2010 - The theory related to the 30 April 1756 baptism record of Jeanne Louise Dumonce, as it relates to her recorded godfather, a Jean Baptiste David La Vigne, has been reworded.